Hays County voters will see two local bond propositions on the ballots this November, both related to safety measures. Proposition 1 deals with public safety facilities, emergency services, and technology. The total project cost for Proposition 1 is $106.4 million. A wide range of public safety professionals worked with the county to develop Proposition 1 and the Hays County Commissioners Court voted 5-0 to place it on the ballot. View the ballot language for Proposition 1. These three aspects of the bond are designed to increase public safety in Hays County. The county hopes to get more help to people in emergencies, to give law enforcement officers the tools, space, and training they need to serve the public effectively, and to provide a safe, secure place to hold inmates, including those who are a danger to themselves or others. The total project cost for this proposition is $106.4 million. 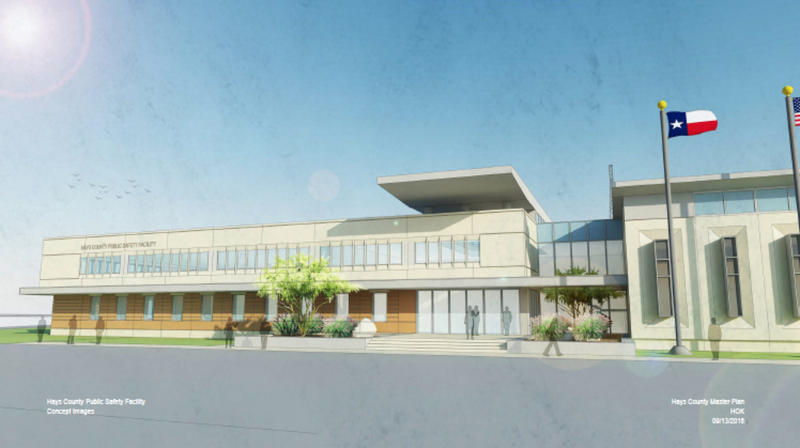 Rendering of the proposed HERO and Law Enforcement Center on the existing Hays County Government Center property. Proposed site plan for the HERO and Law Enforcement Center on the existing Hays County Government Center property. If passed, the public safety bond will fund an improved Hays Emergency Response Operations (HERO) Center, which coordinates emergency services throughout the county. Dispatch efficiency would be improved. Currently, dangerous communication gaps in the 9-1-1 system exist. Improved technology would close these gaps and safeguard against future catastrophe. Currently, the Emergency Response Operations Center is located in the renovated remains of the 1970s jail. Proposition 1 will provide funds to build a co-located Emergency Communications and Emergency Operations Center, which would be flexible enough to adjust as new entities join the co-located facility. Funds from Proposition 1 would build a new, expanded law enforcement center, as well as a training center for new and current officers. The law enforcement center will include space for the sheriff and investigations departments and adequate space for crime labs and patrol units. It will also ensure integrity and efficiency of evidence storage. The training center will have space for law enforcement and jail/detention officer training. The current law enforcement facility provides little flexibility or room for additional expansions or modifications. The current jail was built in 1988 and opened its doors in 1989, and was projected to meet the needs of the county for 20 years. Good management and incarceration reduction programs have extended the life of the facility to its current 27 years. However, maintenance costs have risen due to wear and tear associated with the large inmate population. The county is also paying to house inmates at other counties because Hays County does not have adequate space in which to house them. Proposition 1 will fund an expansion and renovation to the existing jail structure. It will replace failing jail support spaces that are in frequent need of repair, including intake/booking, food service, and the infirmary. To cease the housing of inmates in other counties, 192 additional jail beds will be built.